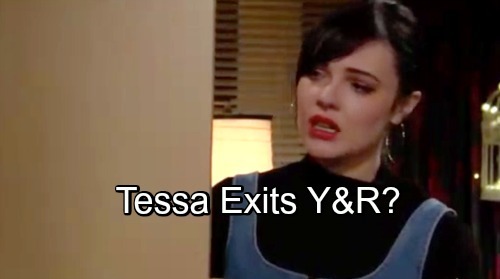 The Young and the Restless spoilers tease that the likable and talented Cait Fairbanks (Tessa Porter) could be leaving Y&R. While purely speculative at this point, it’s fair to wonder if Tessa’s reveal as the coverup crew’s blackmailer spells the end of this character’s time in Genoa City? Longtime soap opera viewers have experience. Their time investment in gaggles of hours, over the course of many years allows them to possess instincts. Seasoned daytime observing veterans remain cautious about the future of any character, meaning Tessa in this instance. But it now seems possible that Y&R is in the process of writing Fairbanks’ character out of the show. Okay, Mariah (Camryn Grimes) knows that Tessa blackmailed Sharon (Sharon Case), Nikki (Melody Thomas Scott), Vickie (Amelia Heinle), and Phyllis (Gina Tognoni). That means those four ladies will soon be enlightened after Mariah tells Sharon on next week’s new Y&R episodes, November 19-23. If the viewers have made this calculation, then surely Tessa has as well. It’s possible that Fairbanks’ character could opt to stay in town and rectify matters with the people she’s blackmailed. But something Tessa said recently indicates that her time in Genoa City is growing short instead. Mariah referenced Noah (Robert Adamson) and Tessa’s intentions toward him. In a seeming character rewrite, Tessa said that she hoped to marry Noah, later leave him and keep whatever money was realized. That is not how her storyline played out at the time, but did remind viewers that Adamson’s recent, brief return allowed both characters to revisit Nessa’s past. This revision feels purposeful. What realistic place would Tessa have in this fictional Wisconsin town now that Mariah doesn’t trust her? The severing of their relationship, which seems complete, not only ends this character’s personal storyline, but will stop her jobs at Crimson Lights and at Dark Horse. What would be left for Tessa to do? Nikki, Tessa’s original mentor, surely won’t stand for being put through the ringer for months by someone who she befriended and also previously had a falling out with. Victor (Eric Braeden) is about to return to GC. He won’t take kindly to learning, which he most assuredly will, what Tessa did to his wife and daughter. That alone would be enough to force Miss Porter out of town. Assuming that Tessa is about to exit, she could be written away, or out. The climax could have her run away from GC, or be pressured to leave while taking the blackmail money with her. A logical destination would be to wherever Crystal (Morgan Obenreder) is living. However, a dramatic ending could also be coming. Might Y&R go so far as to completely eliminate Tessa? Considering the dangerous characters she associated with when helping Crystal locate last summer, this dark finality can’t be ruled out. With whatever happens, it does feel like Tessa’s storyline is ending.